Make Your Salted Egg Dishes Even More Huat this CNY with Salted Egg Shiok! Your customers stand to win more than $1,288 in prizes when they purchase your Salted Egg dishes! The salted egg flavour is still going strong in 2019, and if you have salted egg dishes on the menu this Chinese New Year period, you’re in luck. Your customers can win more than $1,288 in vouchers when they share photos of your salted egg dishes on Instagram. Put yourself on the Salted Egg Map by registering and letting us know the salted egg dishes you want to feature. Encourage customers to buy a salted egg dish and snap a photo for Instagram. Ask them to use the hashtag #saltedeggshiok, and make sure their profile is public. Get ready for lots of Instagram photos of your salted egg dish! Want to shout this out on your social media networks? Download our communication pack to customise your message, or feel free to share our Facebook post with your diners. 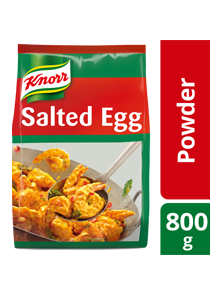 Knorr Golden Salted Egg Powder is a one-step dish base for salted egg dishes. We use real quality egg yolks and the latest drying technology to preserve their flavour, colour and aroma. Now, you can create scratch-quality salted egg dishes in just 1-step! Back to Salted Egg Shiok! Innovative Salted Egg Recipes That Diners Love!